After entering H arvard Business School 1997, Brett Keith joined a study group with a team of five others who would become the nucleus of his HBS experience. The sole female member of the study group was Jennifer Goodman, whose energy and enthusiasm made their morning daily meetings more of a family gathering than work session. The group of six remained incredibly close, regularly meeting for study group dinners to celebrate birthdays or any other event giving them an excuse to get together. Five years after graduation, Jennifer (who became Jennifer Goodman Linn after her September 2003 marriage to David Linn) was diagnosed with a rare cancer called sarcoma, and her battle with the disease not only changed her life, but the lives of countless others she never met. After her first bout with sarcoma, which required two rounds of chemotherapy and a major surgery, Jennifer was pronounced cancer-free. 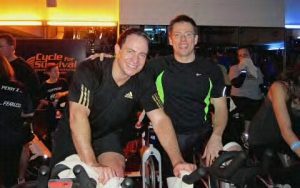 To give back and raise funds for rare cancer research, she and David created Cycle for Survival in 2007, with 100 percent of proceeds going directly to fund clinical trials and research at Memorial Sloan-Kettering Cancer Center. During the ensuing six years, Jennifer’s cancer returned six times, leading her to endure six major surgeries and more than 20 bouts of chemotherapy. Throughout all of this, her optimism and energy shined through in her focus on building Cycle for Survival to make an impact that would reach far beyond her own struggle. Sadly, Jennifer passed away in July 2011, but her legacy continues through Cycle for Survival, which has raised more than $31.5 million to date and is the fastest growing fundraiser of its type in the country. In September 2012, Memorial Sloan-Kettering dedicated The Jennifer Goodman Linn Laboratory for new Drug Development in Sarcoma and Rare Cancers. Rockwood Managing Partner Brett Keith is proud to be a supporter of Cycle for Survival, serving on Cycle’s National Committee. In partnership with another study group member, Keystone Strategy CEO Greg Richards, the combined efforts of “Team Rockwood and Keystone” have raised more than $500,000 for Cycle to date.